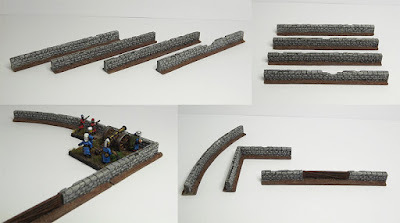 We've got John from Ironclad Miniatures ploughing ahead with some more products for us and next on the schedule is replacing the old walls and hedges from our scenics ranges. These new walls are a much higher quality than the old ones, John's really done a great job on them. Each of the straight sections are slightly different as well, to give some nice variation to your walls. The straights/curves and entrance are all 80mm in length, and the corner is 40mm long. The wall itself is 7mm high and I've included a shot of some figures next to the walls to give an idea of height. We're hoping to have the stock of these with us very soon and we'll get them straight onto the website when they arrive.